Gothic Arches Challenge was to use “This Old Photo”, From Chicks57 Vintage Postcards. Wow What A Sweet Image!!! My funny looking Arch is done by using the, “Fair Isle” Spellbinders Dies. Flowers are from My Moments Stick On’s. 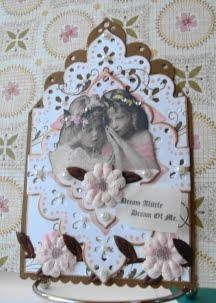 Ink is from Tim Holtz and Pearls are from Michael’s, Rhinestones are from “Martha”. Please remember to leave your e-mail so I can answer you. Vada, Its not funny at all, but really Lovely! I really must invest in more of those dies! Vada - this is so beautiful! 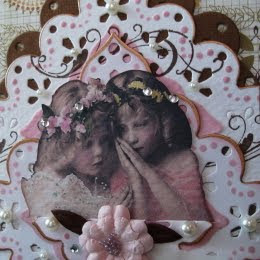 I am totally loving how you have used these dies - gorgeous arch! Cheers! Wow, this is beautiful, Vada ! Those dies make a fabulous arch... what a great idea! Oh I love this arch. Love the edges. Loved the back round of your arch! Wow, fantastic paperpieceing and a wonderfully sweet arch! !